About a God we've never seen, but never fails to side with me." I delivered a sermon once in which I described four categories of understanding, or knowledge columns as I called them. 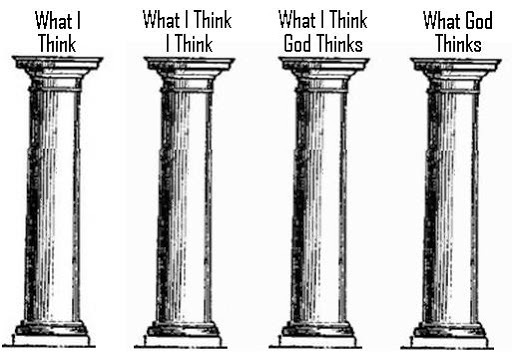 The purpose of these columns, as I'll explain in more detail later, is to address the question of how well we understand god, his will, doctrine, and how we understand ourselves in light of all this. I came across some old notes from that sermon - notes from a sermon I preached in the year 2000 - and that got me thinking about the intellectual and spiritual journey I've been on since I preached this sermon over a decade ago. I began my sermon by explaining the dichotomy between the noumenal and the phenomenal in Immanuel Kant's epistemology (Sounds like I was a boring preacher, I know, but it actually wasn't as bad as you might think). Noumena refers to the "thing in itself" (Ding an sich), or reality as it is independent of our experience of it. Phenomena refers to the appearances which constitute our experiences. Put roughly, the noumenal is reality as it actually is, whereas the phenomenal is reality as we perceive it. Philosophers and theologians have wrestled fiercely with the implications of Kant's epistemic dichotomy. I mentioned it to make the point that things aren't always as they appear. We are fooled easily. Our senses deceive us. Our brains are not reliable. What's more, whether we can ever know the "thing in itself" is a question that hangs over philosophers like the Sword of Damocles. If our senses are all we have to acquire knowledge, how can we ever get beyond the phenomenal? The first column represents what a person actually believes (whatever that may be), not necessarily what she knows or can prove. This column represents one's worldview. Here's where things get tricky. Once I established that god has his own set of thoughts, and those thoughts might not agree with ours, I backed up a step to Column Three, turning the focus back to our perceptions and interpretations. What do we think god thinks? People of every flavor of theism tend to automatically presume (usually without thinking about it consciously) that their values, morals, and preferred virtues are god's virtues, and vice versa. I noted to my congregation how interesting it is to me that so many people follow a god who quite conveniently agrees with everything they believe. And when the average believer runs into a person whose Column One doesn't match up with her Column One, she runs to the Bible or some other noteworthy authority to find "proof" to demonstrate to her misguided friend that Column Four - god's column - agrees with her Column One. Column Three has turned out to be quite a sticking point for me over the years. There's enough disagreement and division in Christianity alone to warrant a healthy dose of skepticism without having to consider all the other religions in human history. 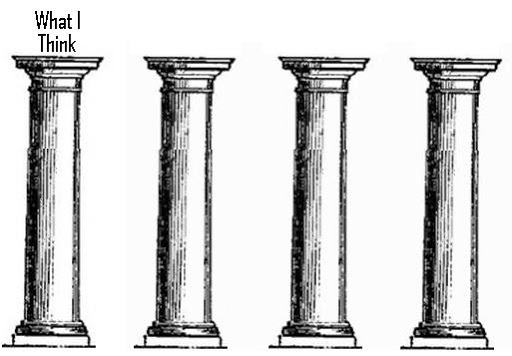 If one of the prime directives of being a disciple of god is, as I preached in my sermon over a decade ago, to get one's Column One to match up with Column Four as closely as possible, why is there so much disparity when we come to Column Three? If god has something eternally important to communicate to the world, why is every message he has ever sent either ridiculously ambiguous, nonspecific or unverifiable? I thought a lot about Kant. Rejecting the traditional arguments for god's existence, Kant denied that we could ever really know that there is a god. A believer in god, Kant wanted to distinguish the noumenal from the phenomenal in order to place limits on human reason. He writes in the Preface to the second edition of the Critique of Pure Reason (1787), "I had to deny knowledge in order to make room for faith." Fans of Firefly (the best TV show ever) will remember Shepherd Book quoting a fictional warrior-poet and psychotic dictator named Shan Yu, who said: "Live with a man forty years. Share his house, his meals… speak on every subject… then tie him up, and hold him over the volcano's edge. And on that day, you will finally meet the man." A person may claim many things about what he values or believes, but when one is put to the test, will his words and deeds match his true convictions? We back up to Column Two, thus completing our Four Columns. This column deals with one's self-perception. It is, in my estimation, an even trickier column than Column Three, for many people might have a difficult time distinguishing this column from Column One. But there is a big difference. Column One contains what a person actually thinks and believes. Column Two contains what a person has convinced herself that she really believes. 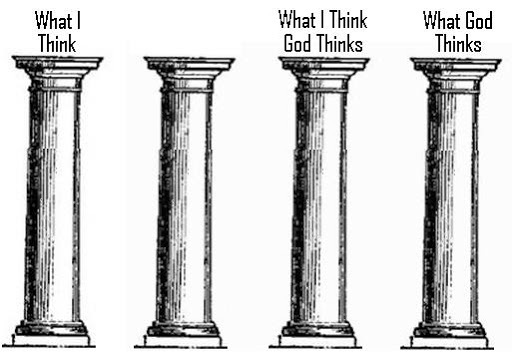 I gave an example in my "Four Columns" sermon of a religious believer who tells himself that he wants to understand and obey the will of god; that is, he wants his Column One to square up with god's Column Four. He tells himself this - convinces himself that this is what he wants - but then he spends every moment of his week aside from Sunday morning doing things that are contrary to god's mandates. In a moment of true contrition, the man realizes that what he proclaimed to the world and to himself has been a lie. What he really valued (his Column One) wasn't what god valued (Column Four). While the man's Column Two seemed to line up with Column Four (or at least Column Three), that wasn't good enough. Near the end of my Christian life, Column Two proved to be the most damning of the columns for me. My entire spiritual life - and especially my work as a Christian apologist - became one attempt after another to convince myself that what I wanted to believe is true. Every argument and piece of evidence I supplied as an online apologist helped to prolong my cognitive dissonance and strengthen the illusion that I in fact possessed the gnosis so many other Christians claim to have. In a moment of deep contrition, I realized that what I thought I believed - what I kept trying to convince myself that I believed - wasn't what I really believed deep down. I saw myself trapped by wishful thinking, denial and resistance to change. I wanted my worldview to be correct. I wanted my Christian faith to be justified. I didn't want to give it all up. I feared the unknown; rather, I feared not knowing. In time, my emotional side caught up to my rational side, and I knew I had no other choice but to own my lack of knowledge; like Socrates, I became aware of my ignorance, seeing wisdom in understanding that I was not wise. Concordantly, I rid myself of this faith that I could not justify and had no reason to believe. After examining my own knowledge columns, I reached the state of mind in which I could embrace agnosticism openly and graciously. 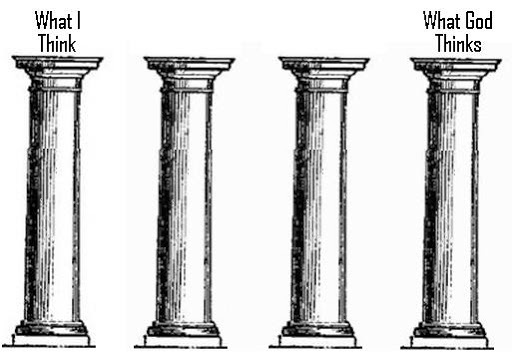 These four columns, meant to encourage believers to seek the will of god, instead became signposts pointing me to the truth that Column Two and Column Three exist only because god hasn't bothered to clarify what's in Column Four. Kant would tell me we can't know what's in Column Four, and that's why we need faith. But why do we "need" faith at all? If we can't know what's there, maybe the truth is much simpler than that: maybe there is no Column Four. In the end, I saw that we don't need faith; we need understanding.